This crazy spring, full of frost warnings and heat waves, has done a number on the plants. 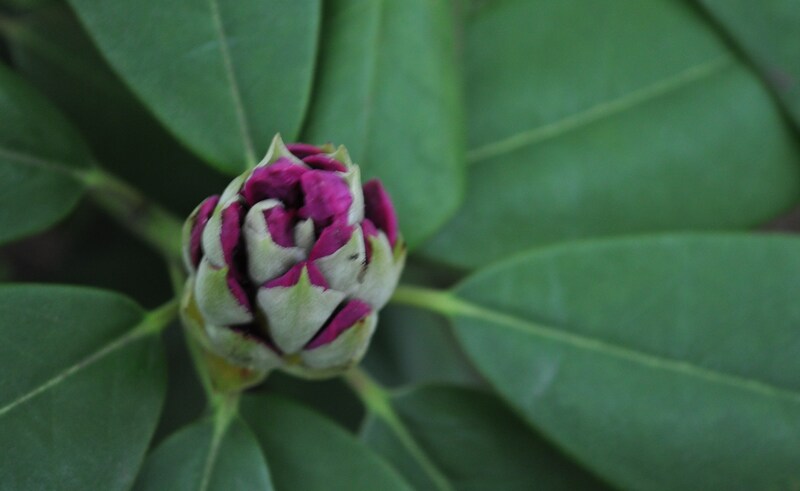 At least many of them seem to have survived the changes and are still on their schedule to bloom. I still have the tomato plants inside though. And, the delicate herbs. The weather in West HoCo is just a little cooler than Ellicott City or Columbia. We also are at 630 feet above sea level, one of the higher points in the county with little asphalt to retain heat overnight, so we get more frost warnings. The spring flowers keep blooming, despite the strange weather. 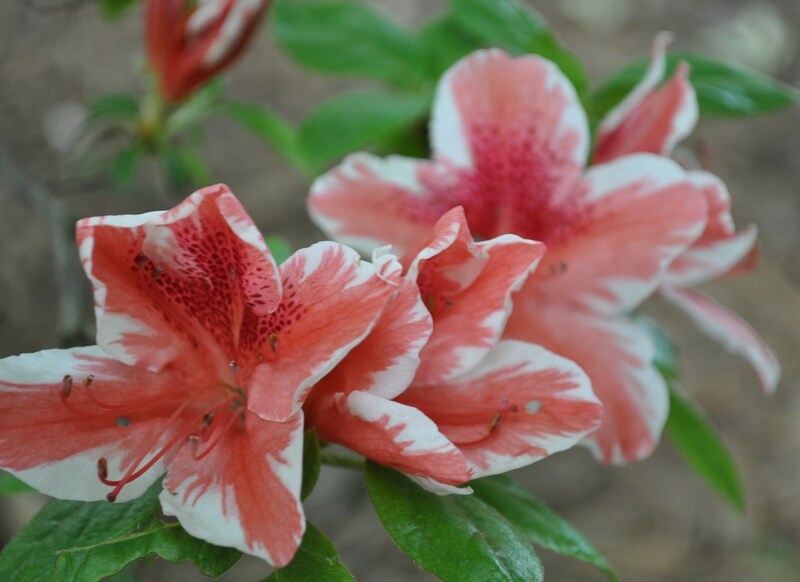 I noticed yesterday that my candy stripe azaleas were beginning to pop open. I have two of this variety, and though they are a little spindly, they really do add a nice touch of color to the yard. They bloom much later than the others, like my red varieties. The tangelo azalea is much further behind, and should burst next week. 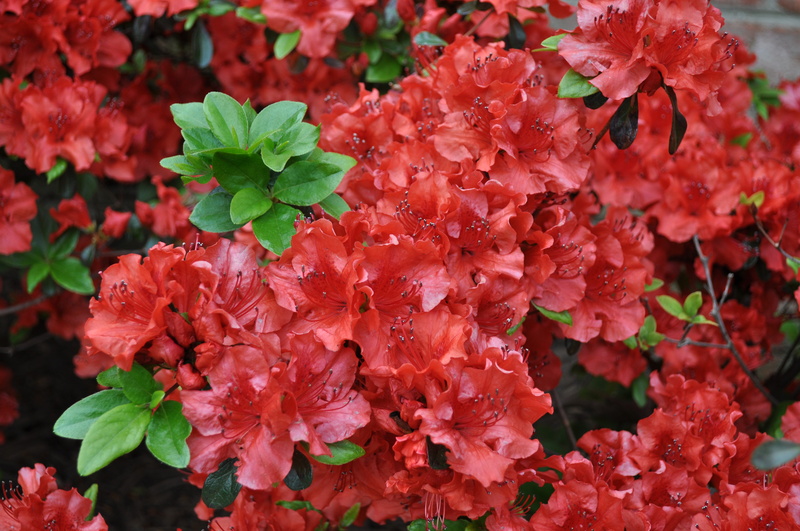 This variety is closer to the rhododendrons in size. It is being dwarfed at the moment by a volunteer burning bush that I have to prune way back this fall. It is at least protecting it from wind and frost damage, though. 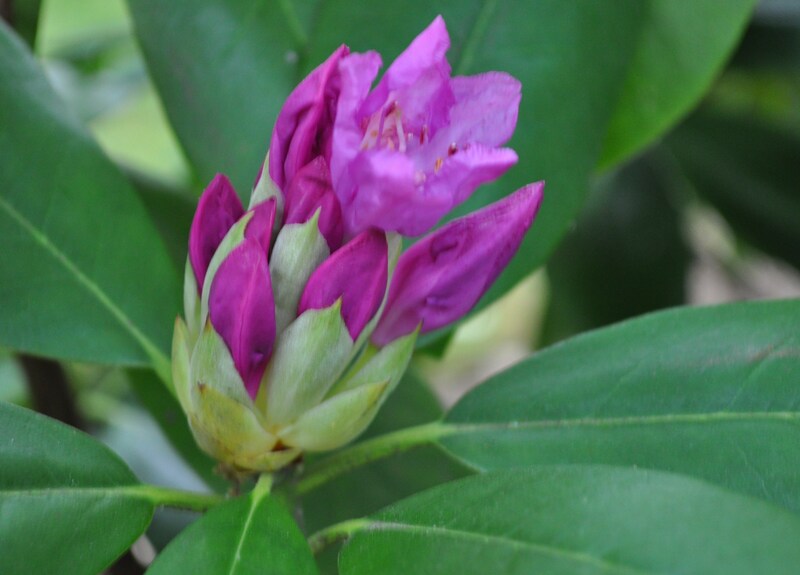 As for the rhododendrons, they are coming along nicely and will soon burst open. One lonely bloom has been the vanguard. Another isn’t far behind. This year I have the most blooms on the two plants. There are dozens of them instead of the 6-8 on each plant that I got other years. I think all the rain last fall made them happy. We bought our house in the winter and didn’t know until spring just how many plants and flowers we had and what varieties they were. Every April, May and June we have the luxury of blooming flowers and trees. 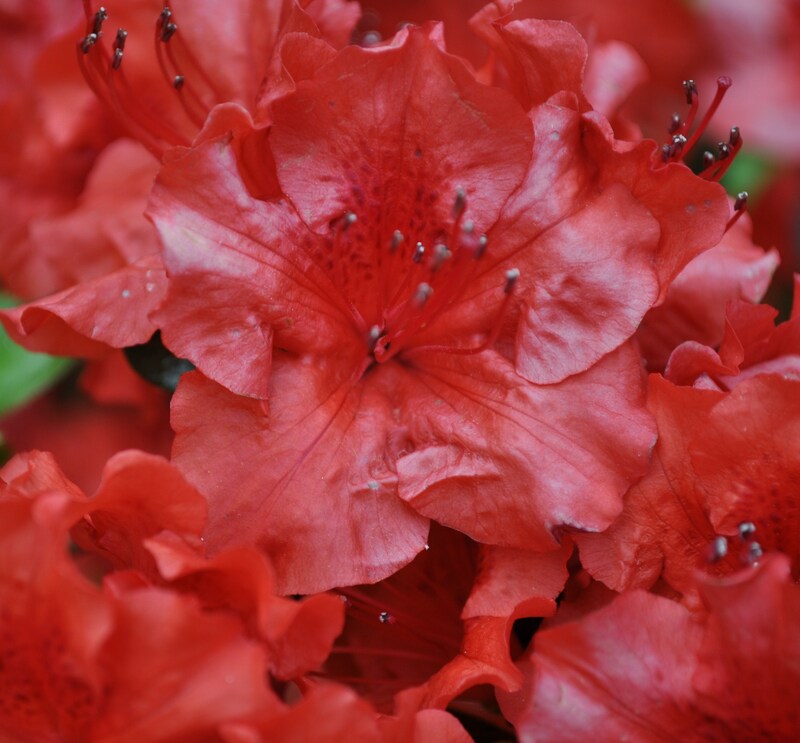 I don’t really need to visit Brighton Dam for azaleas as we have beauty in our back yard. What’s blooming now where you live? 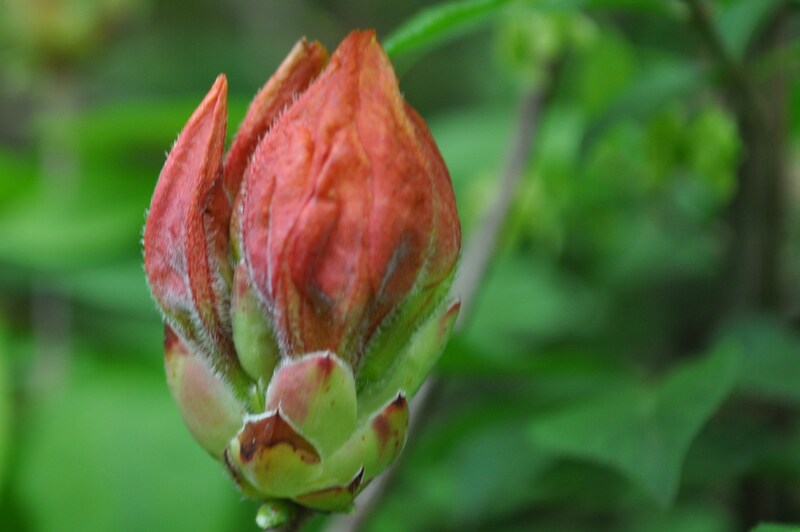 Posted in Gardening, Hobbies, Nature, Weather, West HoCo and tagged azaleas, gardening, hoco loco, Howard County, nature, photography, spring flowers, weather, West HoCo. Bookmark the permalink.